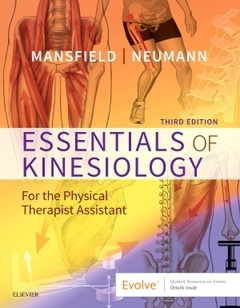 Essentials of Kinesiology for the Physical Therapist Assistant Mansfield Paul Jackson, Neumann Donald A. Authors: Mansfield Paul Jackson, Neumann Donald A. Add to cart the livre of Mansfield Paul Jackson, Neumann Donald A. Get a solid foundation in the language of movement! Essentials of Kinesiology for the Physical Therapist Assistant 3rd Edition builds on previous editions by delivering a rich and varied learning experience that is needed to succeed in today's fast-paced PTA education programs. Clear, concise explanations of anatomy and function, full-color illustrations and unique atlas-style chapters make even the most complex concepts easy to master. In addition, a robust lineup of on- and off-line resources, featuring a companion Evolve website, give students the tools they need to succeed in both the classroom and the clinical setting!